Vividly illustrated and welcoming to the casual reader, as well as to art history scholars and students, this is a general guide to one of the most exciting and meaningful expressions in contemporary American art. From its inception in the 1960s to its present form, contemporary Mexican American or Chicano art has developed as an art of identity, asserting the uniqueness of Chicanos and their dual Mexican and U.S. American cultural backgrounds. Because it emerged as a social phenomenon, however, many people outside the Chicano community have perceived Chicano art as merely protest art or social commentary, and Mexican American artists have been largely ignored in mainstream museums and absent in art history texts on American art. Yet more than ever before, Chicano art is diverse in medium, style, technique, and content—the cutting edge of a bold attempt to redefine and advance the American experience through new ideas of who we are as Americans and what American art is. Contemporary Chican@ Art is a general introduction and guide to one of the most exciting and meaningful expressions in contemporary American art. Intended for the casual reader as well as for art history scholars and students, the book provides an overview of work created from the 1960s to the present. George Vargas follows the dramatic evolution of Chicano art within the broader context of American cultural history. He shows that while identity politics was and still is a prevailing force in Chicano expression, Chicano art has undergone a remarkable transformation, shifting from a strict Chicano perspective to a more universal one, while still remaining a people's art. 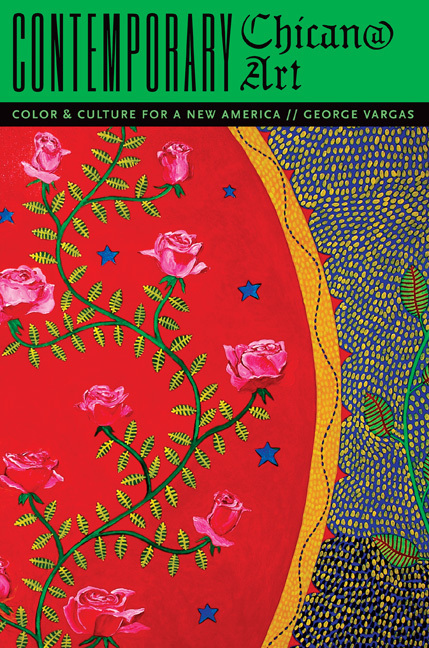 In the concluding chapter, Vargas takes an in-depth look at selected Chicano artists who share their thoughts about the Chicano artistic enterprise and their own work. George Vargas is Assistant Professor of Art History at Texas A&M University–Kingsville. A cultural worker and artist, he has an extensive background in Latin American and Latino studies, racial/ethnic studies, film studies, museum studies, public art, community development, and art/ education administration. He has received numerous academic, artistic, and community awards and fellowships, including a prestigious Ford Fellowship and a Martin Luther King, Jr./Cesar Chavez/Rosa Parks Fellowship at the University of Michigan, and has organized national and international exhibitions, including Chicano shows featuring the art collection of actor Cheech Marin. By the beginning of the twenty-first century, many Americans noticed a Latino presence in their communities and workplaces. The U.S. Census Bureau estimated that nearly 44 million Latinos lived in the United States in 2006. And because Latinos comprise the country's fastest-growing ethnic group, the 2010 Census certainly will reveal a still greater number and proportion of Latinos. Demographers project that Latinos will shed the "minority" label in more areas of the United States as the century progresses. Among this booming population, well more than half are Mexican Americans and Mexicans. They can be found from coast to coast. Mexican Americans—or Chicanos, as some prefer to be called—already make up the dominant population in several Southwestern cities, particularly near the U.S.-Mexico border. This change in racial and ethnic complexion is dramatically reshaping the face of U.S. society. Yet, most other Americans know little about Mexican Americans and their rich history or numerous contributions to American popular culture, literature, music, theater, and visual arts. Scholars have shed some light on the history of the Chicano experience, from the Spanish Conquest of the sixteenth century to the U.S. Chicano movimiento of the 1960s to the present. Despite their increasing presence, however, Mexican American artists are largely ignored in mainstream museums and are absent in history texts on American art. Contemporary Mexican American or Chicano art has developed as a social phenomenon from its inception in the 1960s to its present form. Chicano art has undergone remarkable transformation, shifting from a strict Chicano perspective to a more universal expression; moreover, Chicano art is a creative expression unique to the United States, and it remains a people’s art—by, for, and about Americans. Regardless of aesthetic changes and cultural labels, Chicano artists continue to dedicate their art to their respective communities as well as the broader North American society in which it was created. Throughout its unfolding, Chicano art has served as an art of identity, asserting the uniqueness of Chicanos and their dual cultural backgrounds—of Mexico and the United States. Many have perceived Chicano art merely as protest art or social commentary, if they have considered it art at all. Certainly, identity politics were and still are a prevailing force in Chicano expression. However, more than ever before, Chicano art is diverse in medium, style, technique, and content. Aesthetically, Chicano art brings fresh approaches to redefining and advancing the American experience through new ideas of who Americans are and what American art is. The inevitable crossover of Chicano culture into American popular culture makes the need more pressing to further investigate and document Chicano creative expression. With visual literacy of the Chicano experience one sees how these vibrant threads are interwoven into the rich tapestry of the larger American experience. By examining Chicano visual art one gains insight into physical and psychological forces at play in the evolution of Chicano consciousness and creativity. Better understanding of Chicanos through their art leads to greater appreciation of the unique contributions Chicanos have made to America's economic prosperity and cultural development. I therefore dedicate this book to filling the knowledge gap in mainstream art. I intend for the work to serve as a general guide for researchers and students of Mexican American art history. Most important, I hope that the general public uses it as an introduction to one of the most exciting and meaningful expressions found in contemporary American art. Herein I present a study in the evolution of Chicano art positioned within the broader context of American cultural history. It bears explaining at the outset that because of the peculiarities of gender designations in the Spanish language, I will use terms such as "Chicano," "Latino," and "mestizo" in generic references to mean collectively both males and females. The book is organized into four approximately chronological chapters followed by an annotated catalogue of Chicano artists. In the first four chapters I analyze the Chicano aesthetic at levels of its evolution, paralleling the continued growth of the Chicano pueblo nationwide. Chapters 1 and 2 cover the late 1960s through the 1980s. I first qualify Chicanos as Americans while explaining how and why they have been marginalized in greater society. In the early days, Chicano artists were stigmatized and isolated from the mainstream. While many supported Chicano politics of the times, particularly through public murals and posters, Chicano artists created various forms of art, from social commentary to personal art. By the 1980s Chicano art transformed from a nationalistic identity to reflect a sense of multiculturalism as its artists used various influences and expressions. As represented in Chapters 3 and 4, Chicano art stretched beyond its borders in the 1990s to reach American and international audiences through postmodernism and a broader worldview. A new historicity arising in Chicano art history in the 1990s offered models to identify, analyze, collect, and exhibit Chicano artwork past and present. Though many Chicano artists have successfully crossed over into the mainstream, they have not ignored their identity or cut ties to their respective communities. Finally, Chapter 5 takes the form of an annotated catalogue of selected Chicano artists, their lives, and their thoughts about their art. I offer this view of Chicano art as a means to promote understanding of a Chicano consciousness as well as insight into the great American experiment and diverse cultures within and beyond it. Because of renewed economic and political developments between Mexico and the United States, Americans are increasingly interested in the history and culture of Mexicans and Chicanos. Many Americans have come to appreciate the depth and breadth of Mexican art history through the centuries since its incipience in mysterious prehistoric cultures and advanced indigenous civilizations of Mesoamerica. Mexican art's richness sweeps from these earliest cultures through the colonial art of New Spain, folk art, modern art, the postrevolutionary mural movement of the twentieth century. Today, Mexican art flourishes as a contemporary and universal expression that also feeds into and is nourished by Chicano art. People who study Mexican art are sometimes pleasantly surprised to discover Chicano art because it has been largely obscured by historical amnesia. The vast community of Mexicans and Chicanos living and working in U.S. society has been historically minimized by mainstream America. They typically have been ignored except during times of war and labor crisis. Now, demographic trends cannot be refuted. Americans of Mexican ancestry or origin have been identified by the federal government as Mexicans and Mexican Americans or Chicanos, the preferred label of self-identification in the U.S. Southwest. By recent estimates Chicanos number 28 million, largely young working-class urbanites, and represent the largest subgroup among Latinos, whose population of 44 million also encompasses Puerto Ricans and those of Caribbean and Central and South American descent. The rest of the United States is expeditiously "discovering" the growing U.S. population of Mexican origin, largely due to its mushrooming economic presence. Americans of Mexican origin and their culture will have extraordinary social influence in forging the nation's future. Thus, Chicano art becomes a symbol of new American art for a new America that finally acknowledges and embraces them. Mexicans and Chicanos are the majority population in countless Southwestern cities, but they remain disenfranchised and exploited due to America's ongoing cultural wars as perpetuated by a dominant (white) culture. Portrayed as possessing minority status, their history, language, and art often have been dismissed, denigrated, and even appropriated despite their prominent contributions to U.S. labor and cultural history, not to mention their untapped economic power. The term "minority" has been misused to imply inferiority of Chicanos and other so-called ethnic (nonwhite) minorities. Demographers originally employed "minority" to identify a population that is smaller in numbers than the white majority. However, the U.S. Census Bureau redefined Latinos including Chicanos as a "majority minority" since their population has exceeded the white population in many regions. Regardless of the confusion of identity, Chicanos and other U.S. Latinos serve as a vital part of the general Latin(o) American population. A predominant population of the Americas is mestizo (mixed blood) and Spanish-speaking. Chicanos are the predominant culture in many border states, notably California and Texas. Chicanos constitute a majority minority of more than one-third of the total population in California. Yet they continue to face institutionalized discrimination in employment and education. Chicanos are U.S. citizens with unalienable rights, yet to succeed in mainstream society many Chicanos whitewash themselves as "Americans of Mexican descent" to avoid the blatant discrimination that Mexican immigrants suffer. Despite progress in civil rights, many Americans still tend to consider and treat Chicanos as illegal immigrants ("wetbacks") and as cheap, illiterate laborers who came to cheat the U.S. system or return wealth to a corrupt and poor Mexico. Other Chicanos call themselves "Hispanics," a label that emphasizes their Spanish origins, thus encouraging mainstream America to homogenize Chicanos with Latinos of Puerto Rican, Cuban, and other origins as one monolithic culture. Forgotten as U.S. citizens, Chicanos have been lumped together with other Latino subgroups—including immigrants—into one conquered, Spanish-speaking ethnic group burdened with inferior heritage. Chicanos are regularly pictured as absurd caricatures of unknown origins and attacked with questions like "Does it speak Azteca, Esperanto, or Cholo-punk? Is he a terrorist, a bruja [witch], or performance artist? Is he being harassed by Cortés or the Border Patrol?" One noteworthy common thread that links Chicanos and Mexicans, although it is not always willingly acknowledged, is their mestizo ancestry, as Américo Paredes comments: "Genetically, we are Mestizo (of mixed races, the Spanish, the Mexican Indian, and the African); culturally, we belong to a generalized Mexican culture." Understandably, many Chicanos wish to transcend the stigma of a minority label. Chicanos are uniquely an indigenous and immigrant community in the United States; however, their national identity is often denied in (white) society. Because the U.S. Census Bureau has declared that the majority of Mexican Americans are U.S.-born citizens and generally categorizes them as "white," they are legally identified also as white Americans. In reality Mexican Americans have been and continue to be treated socially as "nonwhite" and "non-American." Much of Chicano art, therefore, speaks to the liberation of Chicanos from their political predicament of mistaken identity. Such artists' efforts have contributed toward a reassessment of historical inaccuracies in mainstream media as well as in such official documents such as land grants, the census, and military service records and toward an awakening to Chicanos' right to a proper identification and place in American culture. In the 1960s and 1970s, the label "Chicano" was mostly associated with political activism. Chicano was an identity and attitude that stressed historical and cultural ties with Mexico while unifying diverse elements in the Chicano pueblo (people) with a movement of consciousness. At that time Chicanismo engulfed the community; it consisted of the various forces of nativism or neo-indigenism, self-determination, nationalism, and activism, and its ripples were felt in high schools and colleges, factories and fields. "A Chicano is a Mexican American with a non-Anglo image of himself," declared Los Angles Times journalist Ruben Salazar, who later was "accidentally" killed by Los Angeles police during the Chicano Moratorium in 1970. The term "Chicano" still is popular among activists but also defines an expanding cultural awareness of Mexicanness that is a part of a broader American consciousness. "Chicano" now is used interchangeably with "Mexican American," more as a descriptive term and less a political one. Other currently popular terms are "Hispanic American," used generally to label all Spanish-speaking people in the United States, and "Latino" or "Latin(o) American" to mean all those of Latin American origins without distinctions according to nationality or native language. Thus the term "Chicano" can reflect both cultural and political awareness. Chicano art represents more a U.S. American identity, less a strict Mexican affiliation. To assume that Chicano art is only political or protest art of the Chicano political movement of decades past is to falsely perceive the true nature of Chicanismo or contemporary Chicano consciousness. Chicano art is rooted in the joys and despairs, triumphs and tragedies of everyday reality. In Chicano communities, artists often are considered powerful creative forces and key representatives of their culture. Artists act as cultural trailblazers, announcing the future of their communities in relationship to the larger society. Chicano art is a significant expression in American art that represents not only Chicano culture but popular culture as well. As people's historians, many Chicano artists portray the truth about living and working in America, the backdrop of their lives and art. "I believe strongly that the artisan has been and still is the historian of people's culture," affirms premier Chicano artist Amado M. Peña. Chicano artists mostly live in urban centers, and the neighborhood barrio symbolizes the heart, soul, and social structure of the larger Chicano nation or pueblo. Furthermore, contextualized within broader American culture, Chicano art calls forth wide aesthetic meaning with social implications for audiences on a universal level. Artists utilize various approaches to express the essence of the Chicano experience, and many appeal to Chicano and non-Chicano viewers alike. In Chicano environments such as East Los Angeles, El Paso, Chicago, Denver, Detroit, San Antonio, and Phoenix, Chicano artists respond to their communities' realities in various ways. Some artists explore their glorious Indian past using traditional media, while others look forward, experimenting with new materials, inventing new images and approaches to their waking realities and dream worlds. The iconography in Chicano art encompasses placas (gang or street art), popular graffiti, murals, graphics, posters, painting, sculpture, mixed media, performance art, filmmaking, video, and conceptual and avant-garde forms. Numerous artists use symbols of the more traditional Chicano home, family, and church, and others portray cholo (Mexican Spanish for "Indian," associated with young Chicanos or rebels) street culture, low riders, working class, and women's struggles. Some artists cultivate classical influences, while others promote postmodernisms. The "look" of Chicano art cannot be strictly defined due to the expansion of the Chicano aesthetic. Artists experiment with electronic music, computer art, spray paint, neon light, and recycled throw-away materials such as bathtubs, car parts, pop-bottle caps, Mexican bingo cards, bric-a-brac, holy relics, and toys. Mostly, they give their works a Chicano sensibility or special accent, regardless of imagery, style, theme, or status as low or high art. Chicano art is grounded in the colorful, complex experience of the Americas. Abundant images or symbols are Mexican-inspired or Chicano-oriented, reflective of the population's mestizo blood and mestizaje, its diverse cultural backgrounds. Chicano people are uniquely American in character and spirit. Chicano art can be interpreted and enjoyed at many levels, regardless of whether the art is created in studios or streets. Knowing how to read the iconography further enriches each viewer's personal experience of the Chicano aesthetic and the influences that infuse its expression. Derived from Greek, "aesthetic" originally pertained to human sense perception. Through the ages, the term became associated with the cultivation of good taste and love of beauty. Following Greco-Roman expression, high culture was increasingly mediated by the church, patron-connoisseur, museum, and critic, defining and limiting the perception of art from the Gothic and Renaissance periods through modern history. In one way or another, the connotation is that "high" art reflects the ideas and achievements of the ancients and "low" art does not. In time, art history organized the aesthetic according to a philosophy of art and its creative process. In sixteenth-century Italy the first art historian, Giorgio Vasari, declared the Greeks as the original source of ideal beauty and naturalism. When Vasari published Lives of the Most Eminent Italian Architects, Painters, and Sculptors in 1550, he constructed the ideological foundation of the study of art history for future art historians. An architect and painter of notable success, he also established an art school to train contemporary artists in the classical manner. In 1750 German philosopher A. G. Baumgarten established the term "aesthetic" in the study or philosophy of beauty centering on sensual perception and the rationalism of ancient philosophers. Centuries after the demise of the Greek empire, Greek or classical art again reigned as the universal standard for truth, good, and beauty, signifying the supreme expression, opined Johann J. Winckelmann, author of The History of Ancient Art (1764). Associating "good taste" with Greek art, Winckelmann urged artists to study Greek art and reject contemporary practices. Lover of antiquities and a trained archaeologist as well, Winckelmann was the first to use the categories of style on a broad basis in the development of a "history" of art. Like Vasari, Winckelmann argued that classical art perfectly represented ideal beauty, naturalism, and truth while underpinning the values of European culture. His scientific methods in the study of art helped to invent a new academic discipline. His contemporaries and later critics similarly elevated Greek art over other cultural expressions, thereby, intentionally or not, downgrading remarkable contributions made to Western art and architecture by non-Western civilizations such as those in Africa, the ancient Americas, and Oceania. The classical aesthetic was advanced in the academy and became institutionalized in both salon and museum. Although Roman, medieval, and Renaissance art were later added to the list of masterpieces, Greek works represented the canon of great art; advocates of Greek art rose to authoritative status in their advancement of an academic art. Unquestionably, the classical model played a critical role in the creation of the aesthetic in modern art history, which grew more conservative and Eurocentric over time. In the New World, classical influences of the Western aesthetic greatly affected the evolution of American art. However, no longer is the classicist tradition the most natural one for artists to practice and Americans to embrace. Today, with the rise of multiculturalism in society, paradigms in art history and criticism are beginning to shift to include nonclassical, non-Western expressions of world art, in turn offering more a psychological interpretation of human experiences, less a Eurocentric, scientific interpretation. How one sees art is shaped by an institutionalized framework, which is directed by a predetermined ideology or aesthetic dictated by the art authority, if you will. Upon entering a museum or cultural "temple" where the ruling authority and its aesthetic are served by a head curator or "high priest," the viewer already carries preconceived notions of art and beauty. He or she may approach precious artworks according to unwritten rules of the museum-temple in the worship of high art. Human experience of an art object is even influenced emotionally by how it is physically exhibited within the walls of the museum or in the "white cube" of gallery space. One might see "real art" only when it is categorized within the context of picture frame and pedestal in the museum environment. Curators, mostly white males, instruct visitors concerning art's domain, its meaning, and even its valuation. Indeed, the high monetary value of artworks no doubt leads to a common notion that only the rich can afford and therefore deserve great art, a notion that many of the upper class also entertain. What is known generally about art and its aesthetic is predicated by the museum experience; for many museumgoers the museum is the authoritative repository of art. Thus, one's view and understanding of art are manipulated by elite cultural mediators. Museumgoers of diverse backgrounds leave satiated after the ritualized consumption of art, the museum-temple protected by guards and its priceless treasures secured under lock and key. Due to lifelong social conditioning, one can carry around a sacred image of the museum in the mind, automatically discrediting art that deviates from aesthetic standards. On rare occasions when non-Western art is displayed, museum experts usually explain the works in a Western context with clinical detachment. Being product-based consumers, museumgoers tend to commodify art, glorifying the object and disregarding the creative process. Once, art served people in their daily lives, but creative expression became a commodity, and most artists became merely workers struggling to survive in an industrialized marketplace. Freed from its shackles of institutionalized conservatism and materialism, art has the power to liberate and heal, which is why it is a meaningful expression in the Chicano community. Some critics will argue that the word "aesthetic" should not be applied to Chicano expression, asserting that the term applies only to European or Western art—high art that best epitomizes Eurocentric ideals. These critics condemn Chicano art and label it as an anti-art that refutes both art authority and traditional aesthetic. On the contrary, Chicano art possesses a true aesthetic, mirroring a diverse and ever-changing Chicano reality. Today's Chicano art is multipurpose and multifaceted, social and psychological, American in character and universal in spirit. It has flourished beyond the boundaries of political commentary and can be appreciated by broader audiences. Its artists use both Western and non-Western sources for inspiration. Historically, most Chicano art has been made in the name of the people's art movement, outside the museum structure and hierarchy, so the establishment continues to associate it with radical or protest art. Thus, most Chicano artists continue to be marginalized by mainstream museums, their creative works misunderstood due to cultural bias. Because of this social indoctrination, Chicano art does not readily appear in the mental picture of museum walls. As America moves through the twenty-first century, its people must reconsider the old Eurocentric aesthetic order and complement it with a contemporary aesthetic more appropriate to the new American cultural landscape. Meanwhile, the Chicano aesthetic continues to transform itself within the larger Chicano community without waiting for institutional approval. Its artists and caretakers convert to new paradigms of perception, beauty, truth, and identity in the analysis and presentation of a new American expression. Early study of aesthetics arose from the need to reconcile the artist as authority with society's dominating role in the production of officially sanctioned art. Truly, who defines art and decides its role and value in a free society? Great art movements were born among artists protesting absolute control of art by the state, church, and elite and forcing changes in the role and purpose of art. Regardless of the progress of artists, the battle yet continues over control of art. One must also consider that despite "art for art's sake," the idea of art cannot be separated from social, political, religious, and cultural forces of the era in its creation. The art object is not born in a lifeless vacuum. Art is imbued with the spirit of the time in which it was conceived, and it belongs to the people, not the establishment and its agents. So whom does one believe—artist or art authority? The Chicano aesthetic is motivated by this long-standing tension between artists and the art authority. Much like other contemporary expressions, Chicano art can be read at different levels, from the most basic to a more complex interpretation. Trained art experts decipher codes of the Chicano experience found in images, signs, and symbols of two predominant cultures, Anglo and Latino, that coexist usually in conflict but sometimes in resolution and compromise. Many Chicano artists continue to address social justice inside a political arena, while others render more personal representations of beauty and truth. Within the context of dialectical materialism, all art however is political. Some expressions are decidedly more dangerous than others to the status quo. This is the case with Chicano art in the United States. Branded as mavericks, Chicano artists are restricted to a forbidden zone behind a "Tortilla Curtain" and marginalized for refusing to homogenize their unique identity and cultural expression. Historically, many critics in Mexico also have dismissed Chicano art's authenticity as a Latin(o) American expression. However, the anti-Chicano climate in Mexico is slowly improving. Mexican artists are collaborating with Chicano artists in performance and installation pieces and mural production. Some are appearing together in international exhibitions. Still, Mexican and Chicano artists are largely excluded in the United States. When Mexican art is presented in U.S. galleries, it is often for political reasons. Mexico regularly sends blockbuster exhibitions to the United States when it needs to strengthen its economic relations with its northern neighbor. Mexican and Chicano artists continue to deal with the fallout from the Mexican mural movement. Although the vast majority of the movement's artists were formally trained in art academies, Mexican muralism was considered by outsiders as derivative, communistic, and angry because it was financed by a postrevolutionary Mexican government. True, Mexican muralists in their production of people's art sometimes attacked the concept of imperialism with harsh images of U.S. capitalists. Today, Mexican muralists continue to be pigeonholed as "socialistic" and denigrated by many U.S. art experts despite the artists' growing international fame. Parallels can be seen between Mexican mural art and Chicano mural art. Both American expressions continue to be targeted by institutional censorship, and both are usually omitted from standard history of art texts. When Mexican art does appear in U.S. art history books, it is briefly mentioned. To this day, Chicano art is not included in the same textbooks. The Chicano aesthetic deserves its rightful place in museums and university forums—it is a genuine expression unique to the United States. Gradually, Chicano art is gaining entry into the mainstream through a few progressive museums and art schools. Chicano artists, however, must resist becoming complacent or stupefied with limited success, as art is still being judged with historical prejudice. Chicano art continues to be stimulated by the Mexican connection, including pre-Columbian, indigenous, and Mexican modernist styles. It embraces a universal sensibility of international influences, new art ideas, and a new Chicano psychology. Chicano artists constantly (re)interpret the diverse American lifestyle: "How do we perceive ourselves as Chicanos and Americans? How do we articulate truth, beauty, and the meaning of life?" To answer these questions, the Chicano aesthetic has assumed many forms throughout its history. Scholars and students are interested in the Chicano praxis, the integration of theory and practice, as the aesthetic shifts to meet vast changes occurring in the quantum field of world art. Art can serve as a visual text or document for students and scholars when other expressions of material culture are limited or undiscovered. As such, artworks are signposts of consciousness that reveal the condition of humanity in a particular culture at a specific time. In the case of Chicano history, the exhibition and preservation of Chicano art is critical. Art represents a visual record of the Chicano presence in U.S. history. Through the photographic document [that pertains] to the common man/woman, my choice is to engage the issues rather than escape them. . . . Visual symbols and words serve as clues or signifiers offering a means by which the viewer can be a participant. The contents of these [cityscape photos] not only reflect upon the people who are its occupants but also speak about our species as a whole. El Paso painter Ernesto Martínez creates painted texts of U.S. military history, particularly contributions made by Chicano men and women in the armed forces. California artist Consuelo Underwood combines the influence of indigenous expression with contemporary Chicano history in her tapestries to record Chicano culture in America. When Chicano artists emphasize social production of art, they become cultural workers as well artists, speaking from the heart and soul of their communities. They use a Chicano perspective to address a Chicano state of mind or psychology, giving both Chicano and non-Chicano viewers a picture of Chicano culture at a given time in space. Abstract thoughts and ideas come to life through the artist, who makes signposts in the form of murals, sculptures, and other visual expressions. Among the most accessible expressions of the Chicano art movement, murals have their own fluid visual language of environmental communication. Integrated with the built or architectural environment, murals communicate a message about the people who live and work in the neighborhood. Their pervasive place in the development of Chicano art is now a major part of the Chicano aesthetic, since many of the better-known figures in Chicano art produced public art. The East Los Streetscapers—Wayne Alaniz Healy and David Rivas Botello—contributed much to the mural movement in Los Angeles for many years and inspired other artists. Certain regions have developed distinct mural styles or approaches with an iconography that can be easily read by the knowing eye. For example, in El Paso many murals address immigration issues, reflecting intense U.S.-Mexican border politics. Images of immigration agents, helicopters patrolling the Rio Grande, barbed-wire fences, and high-tech security devices are found juxtaposed with poor and humble Mexican workers crossing the river in search of the American Dream. Some El Paso muralists emphasize the dominant religion of the border by painting popular icons such as La Virgen de Guadalupe and Jesus Christ. El Paso muralists like Carlos Rosas and Lupe Casillas tend to employ large horizontal designs that match the vast desert landscape and dominant one-story architectural style and brilliant colors reflective of the ever-bright sun. In Michigan, muralists might portray auto workers laboring on the assembly line. Tall buildings crowd the Detroit skyline, so muralists tend to employ a vertical format to enhance their cityscapes. In California, many murals are located close to the street due to the dominance of car culture. Low riders might populate murals painted in graffiti styles especially in Los Angeles, a center of this national trend. Consequently, distinct regional mural languages emerge, a visual lingua franca between artist and community. Within the context of U.S. (capitalist) society, Chicano art communicates a political message. In a strongly media-oriented society, signs and symbols of the dominant political ideology spill over into personal subjectivity. The false language of elitist art is skewed with both blatant and subtle messages of consumerism that influence the status quo. Within this context, Chicano art symbolizes creative freedom. It refutes this elitist art, constantly infusing new political and spiritual meanings into a visual language meant for the people (politikos, Greek for "citizens"), not the elite. Chicano artists transcend the barrio, bridging over into the greater arts community. They are dynamically contributing to a fresh cultural environment for all American people, a democratic art grounded in cultural pluralism and social and creative freedom. This movement toward a more democratic art started in the 1960s. Early Chicano artists of the 1960s and 1970s supported the Chicano movimiento by creating posters and murals addressing social and economic issues such as inequality in education and employment. A vital component of the people's art movement (a grassroots movement composed largely of people of color in particular and women of diverse backgrounds in general), most Chicano art of this period predictably expressed an anti-establishment or militant perspective. Chicano artists identified with the revolutionary art of France, Russia, and especially postrevolutionary Mexico. Produced by individuals and art groups alike, Chicano posters and murals of this period portray popular Mexican and Chicano revolutionary heroes like Emiliano Zapata and César Chávez, as well as other Mexican icons like Quetzalcóatl and La Virgen de Guadalupe. The message was meant to educate the people: Indians, mestizos, and poor and working-class Americans of all colors. In Josefina Quezada's 1978 mural Read on an exterior wall at the Anthony Quinn Public Library in East Los Angeles, the message is quite simple and obvious for all. The signs and symbols, taken from pre-Columbian times to the present, urge viewers to read; the mural promotes literacy as a way to liberate oneself and advance the broader community. The social tumult of the 1960s and 1970s fostered Chicanismo, a collective consciousness that thrust the Chicano pueblo in the direction of self-liberation. Activists wrote manifestos and strategy plans to achieve collective goals. Political organizers invited Chicano artists to serve as cultural workers in the creation of national art, much like the Syndicate of Technical Workers, Painters, and Sculptors did in the early twentieth century among leading artists of postrevolutionary Mexico. Chicano artists came together to form groups and collectives, many of them using a manifesto or platform to describe their mission and goals. They further dedicated their work to the empowerment of the local community. Chicanos were not alone in this effort to democratize American art. Simultaneously Asian American, black, and Native American artists joined nationalistic political organizations in their respective communities, causing a social phenomenon of the times whose ripple still affects American art today. Heeding the call from political leaders, Chicano artists identified with the movement. Some joined multicultural art organizations or other community-oriented groups and donated their artistry to the self-improvement of the broader community. Chicano artists were perceived as important activists in official manifestos like El Plan Espiritual de Aztlán (the Spiritual Plan of Aztlán), which promoted nationalism, seeing it as "the key to organization [that] transcends all religious, political, class, and economic factions or boundaries." Written in 1969 at the first National Chicano Youth Liberation Conference in Denver, the manifesto called for active participation of literary, performing, and visual artists. Cultural values of our people strengthen our identity and the moral backbone of the movement. Our culture unites and educates the family of La Raza towards liberation with one heart and one mind. We must insure that our writers, poets, musicians, and artists produce literature and art that is appealing to our people and relates to our revolutionary culture. In building their empire, Aztecs adopted the history and culture of previous Mesoamerican civilizations and wove their own culture and religion into the existing traditions. Like ancient Aztec empire builders incorporating other civilizations into their own, Chicanos began synthesizing their native heritage into contemporary U.S. culture. Likewise, Chicanos legitimized their position in U.S. society by embracing their Mexican Indian past and synthesizing it into modern American culture and art. Chicano artists constructed a Chicano mythology, partly Mexicanized and partly Americanized, befitting a New World culture. Much like the migratory Aztecs of ancient times, "a people with a mission," twentieth-century Chicanos were migratory and believed they were fulfilling prophesy as La Raza Cósmica, the cosmic race, a philosophical concept derived from the mestizo hybrid of the New World. Whether one perceives this romantic view of Chicano origins as factual or fabricated, it is a permanent facet of Chicano cultural expression. The historical veracity of a cosmic race is less important than the way the idea passed through countless generations, traveling from Mexico to the United States. Its value lies in what it reveals about human nature through a shared spiritual quest. Moreover, Chicano mythology is a living social phenomenon of American culture. The Chicano movement as envisioned by its forefathers served as a metaphor for an American people's spiritual search for a true home and social acceptance within U.S. society. Toward this goal, art was tied to the powerful cosmic cycle of change—life, death, and rebirth—that has impacts on both nature and human civilization. Artists in this period represented the search for identity and regeneration in exciting pictorial values. Arizona sculptor Alex Garza, for example, carved strong figures of Chicanos caught up in transition and change. In Earth Abyss , Garza depicts a partially formed man, part flesh, part skeleton, emerging from (or being swallowed by) Mother Earth's womb. The sculpture symbolizes the birth of Chicanos as a new people and the threat of death that affects everyone. By the 1970s Chicano art had gained momentum nationwide and attracted public attention. It was hailed by some and attacked by others. Chicano artists often were lumped together as "militants" and scorned, irrespective of any political affiliation. Numerous Chicano artists were falsely accused of being un-American, and their artworks were censored. Critics especially condemned Chicano murals, associating them with Mexican revolutionary murals. Early murals by Martin Moreno in Adrian, Michigan, unintentionally but predictably caused an ugly backlash of racism and threats of censorship. In a city with a predominantly Mexican and Chicano population, he painted murals honoring Mexican and Chicano field and factory workers accompanied by Aztec gods and revolutionary heroes. He suffered malicious intimidation, but his work was saved due to community pressure on civic authorities. By the late 1970s many Chicano artists found themselves making aesthetic and ideological adjustments, moving from strict nationalism to universality and humanism. Yet others remained loyal to Chicano art as an educative tool and ideological weapon in the ongoing fight for social justice and economic opportunity. Whether by chance or choice, a new Chicano art joined the ranks of popular art expression, disputing preconceived notions about politics, class, race, and art. Jerry Dreva's provocative photo montages and graphics defied the trite notion of "good taste" in both Chicano art and mainstream art. For instance in Dreva 1977 , a black and white photo montage, the artist poses with a banana and a novel by William Burroughs to protest mediocrity and paranoia concerning new Chicano art and its experimentation with vanguard expression, such as performance and anti-art. Dreva also aligned with Iggy Pop and punk-rock culture, revealing Chicano art's new position in American popular culture. As a Xicana-Azteca, I feel we must continue to use our creative skills to give strength to our political, cultural and spiritual struggle. We must make visible our resistance to deception and the celebration of genocide. The emphasis in Chicano art began to broaden to include more self-expression independent of hard-line Chicano ideology of the 1960s and 1970s. A personal expression of the Chicano experience might have social or emotional impact without engaging in the polemics that accompany political art. Michigan artist and art teacher José Narezo, who died in December 2008, had voiced his view of art as self-expression: "I believe that art needs to be pure in the sense that it comes from the emotions within." Whether representational, expressionistic, or abstract, his work communicates a Mexican or Chicano spirit but is not political in nature. Narezo's outdoor and indoor murals in his hometown of Grand Rapids and throughout Michigan convey abstraction and nonobjective styles. In the 1977 mural El Centro de Vida (The Center of Life) on the campus of Grand Rapids Junior College, Narezo and young artists painted a 250-foot-long temporary construction barricade that surrounded a new building site. The mural combined elements inspired by Aztecan temple relief walls with Matisse's abstract paper cutouts. Narezo would find no true Chicano art movement in Michigan today, for there are no longer any great causes unifying the artist and the community. Yet, Narezo contended, Chicano art flourishes in the Midwest and throughout the nation. More artists are entering art schools; some have gained national and even international recognition. The content of their art inevitably has changed over the decades. Questions of self, reality, the environment, and the role of the artist are posed in the context of artistic sensibility—rather than from a strict or ideological point of view. Narezo explained that at one time it was convenient to be labeled a "Chicano" artist. Over time it has become a burden, for it invites "pre-conceived expectations" of what Chicano art is or must be. "I cannot fulfill those expectations," he stated, "because my vision is different." For Narezo, Chicano art represented a universal consciousness or humanistic attitude rather than a certain image, style, or political allegiance. Personal expression in Chicano art is complex in style and iconography, serving as a visual mirror of the nature and condition of Chicano artists who reflect their own hopes, fears, social concerns, and achievements. The diversity found in Chicano subject matter and iconography can be traced to the growing ranks of Chicano artists, trained and self-taught, exploring personal expression in innovative ways. In Texas, individual artists like Delilah Montoya in Houston and Bruno Andrade in Corpus Christi possess sharp, clear, universal sensibilities that transcend borders. A professor of photography at the University of Houston, Montoya records the faces of Chicanas and Chicanos through photographic portraits that reveal a shared American experience. Her present oeuvre documents women boxers and is reminiscent of portraits by American photographers Diane Arbus and Richard Avedon. Andrade, a professor of art at Texas A&M University at Corpus Christi, mainly paints expressionistic landscapes and still life usually devoid of recognizable Chicano iconography. His pictures reflect the influence of German perception psychologist and color theorist Rudolf Arnheim, with whom he studied while attending the University of Michigan. A master of painterly light, Andrade recreates the distinct Texas environment using imagery and a color palette that reverberate with the spirit of French modernist Matisse. As in the past, today the issue goes beyond Chicano art's place in history or the assessment of its "quality." The question is what art is saying about the American experience and how it is saying this, particularly in nonpolitical terms. Chicano art increasingly speaks of the human condition in personal and intimate terms beyond the body politic.